More than just a flashlight, the HazLoc Lantern allows the operator to inspect and then work hands free in hazardous locations. Aug. 9, 2012 - PRLog -- KH Industries’ new intrinsically safe LED HazLoc Lantern provides inspection and maintenance professionals a portable, hands free explosion proof work light with a 10 hour run time. 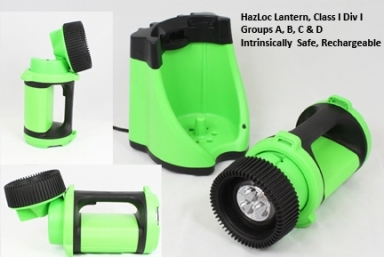 The HazLoc Lantern is certified for Class I Division 1, Groups A, B, C, and D Hazardous Locations. The HazLoc Lantern is ideal for operators in industrial and commercial environments classified as hazardous locations. The HazLoc Lantern’s exclusive feature is a 340° rotating head with 70° pivoting angle that allows the operator to position the light either horizontally or vertically and angle the medium spotlight beam directly at the worksite. “More than just a flashlight, the HazLoc Lantern allows the operator to inspect and then work hands free in hazardous locations.” says John Herc, vice president of sales and marketing, KH Industries. Certified and Listed for: Class 1 Division I, Groups A, B, C & D, Class II , Groups E, F & G, Class III, T4,cUL Listed, UL 913 Certified and NFPA Approved. The HazLoc Lantern features a shatterproof design comprised of High Impact ABS, an Unbreakable Lexan® lens surrounded by a molded rubber bumper to absorb shock. “Safety, portability, and the reliability of 10-hours of bright and continuous light output make the HazLoc Lantern an indispensable inspection and work light for maintenance and repair professionals operating in work environments classified has hazardous locations.” explains Herc. Typical applications for the HazLoc LED Rechargeable Lantern are underground utility maintenance, oil, gas, and pipeline inspection and maintenance, refineries, oil rigs and off shore drilling, Hazardous material manufacturing and storage, grain elevator maintenance and inspection, mining, emergency response, and aircraft/helicopter maintenance. KH Industries acquired Sunlite Safety Systems, LLC in September 2011. The HazLoc Lantern was formerly sold under the name GX1. As part of the acquisition, KH Industries’ has ownership of all dies, molds and stampings, and existing product. KH Industries is the sole manufacturer of the HazLoc Lantern. For additional details, visit: http://www.khindustries.com. Or call: 716-312-0088.